The essentials of traveling hit you when you’re going to a long vacation, an adventurous trip, or an outdoor activity, which all requires you hauling oversized gears or pieces of equipment that won’t obviously fit in your car. Crossbars are one of the most important things to install on your vehicle’s roof. These things are the ones that support your cargo on your roof and are mostly where you hook your things on to. This article tackles the best roof rack crossbars that you may choose from, or add to your choices and must-try vehicle accessories. Because a lot of companies are offering the same products that only differ with the design and style it has, it’s pretty hard to figure out what you have to purchase, especially if you’re new to the situation and equipment. The things that you have to know before purchasing crossbars are somewhat similar when buying cargo boxes. You should know the things you’re bringing along with you on your trip; possible weight, how bulky it is, and the likes. Be aware that the weight capacity of your crossbars matters a lot and you should always be careful not to exceed the given maximum weight capacity. Knowing which crossbars are compatible with your vehicle saves you a lot of time and protection against damages like car scratches and broken equipment. You can search for different crossbar units to know if the crossbars are suitable to install on your vehicle. 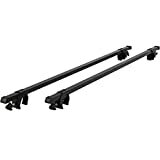 In this section, counted roof rack cross bars of different brands are reviewed and are labeled as the top 9 best roof rack cross bars available in the market today. Below are the chosen products for you to choose from. CargoLoc’s 2 piece aluminum roof bars are 46 inches each and are lockable for guaranteed security. CargoLoc sees to it that they only distribute products of high quality and durability, strength and consistency, to offer the best product to their consumers and exceed their expectations. The roof cross rails can hold a weight capacity of up to 150 pounds, featuring great functionality, especially for those travels a lot with multiple gears with them. The manufacturer provides a limited lifetime warranty for this unit. Vault Cargo Management’s universal roof crossbars are designed to haul multiple amounts of gears for outdoor use. These roof bars are 53 inches long from end to end, 1 inch high and 2 inches wide. They are lockable and have 2 sets of keys to secure your cargo. These offer an aerodynamic low-profile design to make your traveling more convenient. Vault’s roof cross rails come with end caps for protection against sharp edges. The crossbars can be detached with one tool that comes with it. Additionally, the unit has a weight capacity of 150 pounds and is compatible with a variety of cargo like roof bags, kayak racks, canoes, and roof boxes. Summates’ universal roof cross bars are constructed from high strength aluminum and are finished with metallic silver marine grade powder coat. These are lockable roof bars that provide cargo security and have an adjustable width for extra fitting. They are each 47 inches in length and have a weight capacity of up to 200 pounds. However, it’s an important note that the cargo must not exceed said maximum capacity. It’s also very essential that you frequently check the crossbars’ mounting screws to know if it needed to be retightened. 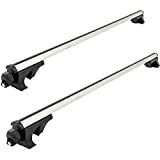 Apex Universal Aluminum Locking Roof Cargo Bars each measures approximately 53 inches in length, 1.5 inches wide and 1 inch high. The crossbars make use of the car’s side rails to provide increased storage space. These are also lockable for security measurements. 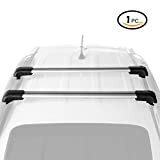 Being the roof bars for cars, trucks, SUVs, and minivans, these can be installed on most vehicles today. These are made of high strength aluminum, providing a weight capacity of up to 150 pounds. This model of Apex’s crossbars can be attached to the car’s roof using straps, making the installation quicker and much easier than the normal ones out there. With its 150 weight capacity, it has the ability to haul oversized items or gears and utilizes the space on the roof. The bars are made of thick steel, providing high durability. They are also rubber coated to protect the vehicle’s roof and rubber end-caps are also included in the unit for scratch protection. 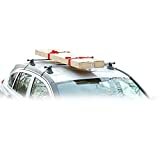 AUXMART’s crossbars for roof rack fit most vehicles’ (with raised side rails) roofs as these have a universal design feature; in addition, they are compatible to a number of roof cargos and gears such as bike rack, cargo basket, and etc. The bars are made of lightweight aircraft aluminum and nylon, featuring high-level durability and functionality. Each bar measures 93 cm in length, while both have a weight capacity of 150 pounds. The unit features a streamline water drop design that reduces unwanted noise while in the go. Its self-adaptive base feet enable angle adjustments. It has thick rubber gaskets and rubber covers on each end to prevent any scratch on the cargo and vehicle. It also features easy assembly and disassembly, with the instructions included in the package. Apex’s universal rooftop cargo carrier crossbars measure 46.5 inches in length and have a maximum capacity of up to 130 pounds. These bars also clamp to the roof side rails of the vehicle. The unit is constructed from black epoxy powder coated steel, providing heavy-duty durability; additionally, the bars have adjustable rubber coated feet to allow easy installation. 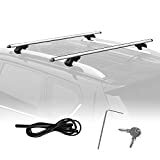 These are great roof bars for cars, trucks, and other vehicles. This rack crossbar is focused on hauling kayak gears, with its adjustable padding for the carrying strength and protection of the said gears. 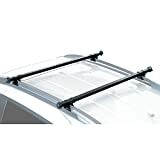 These roof bars have a quick on and off hardware that enables quick and easy installation and removal. The J-bar feature allows you to easily load and unload up to 36 inch wide kayaks. These crossbars can handle a weight capacity of up to 75 pounds. Apex’s universal crossbars are specifically designed to support different types of cargo on the vehicle’s available space on its roof. The bars are attached to the vehicle’s side rails, increasing the space for cargo transport. The unit has a weight capacity of 180 pounds and requires a 36-48 inch distance between the side rails. It comes with rubber-coated clamps that hook on the side rails and lock into place with the use of its turn-knob feature. The knobs are lockable that can be locked or unlocked with keys; this is to provide preventive measures against theft. These crossbars are constructed from heavy duty thick carbon steel with a smooth black paint finish. This is the end of the review article about roof rack cross bars. Hopefully, the article helped you a lot and gave you more options for you to choose from when deciding to purchase one.